After our 5-hour hike we arrive at our homestay in the early afternoon. For those of you unfamiliar with the concept of a ‘homestay’: guests pay money to a tour company who arranges and vets local families who are willing to house and feed you for a night or more. 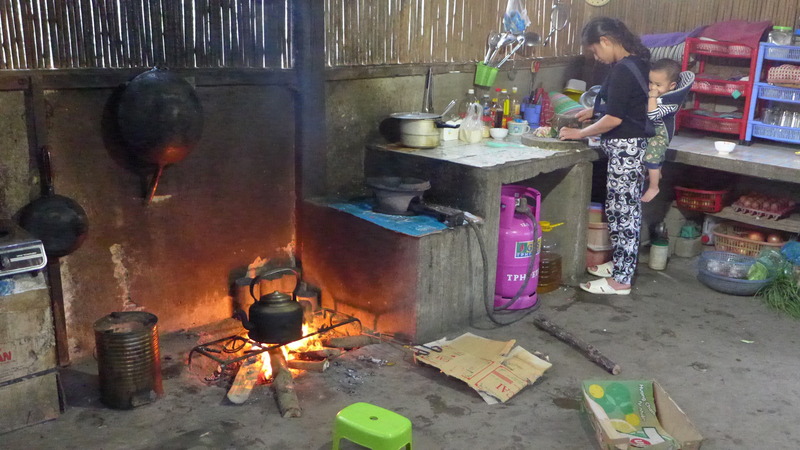 Our homestay was arranged with the same company who we booked the Ha Long Bay tour with. Travelers like this experience because of the interaction with local people in their homes. Usually the family invites you to help get the meal ready and eats with you. View from the balcony beds. 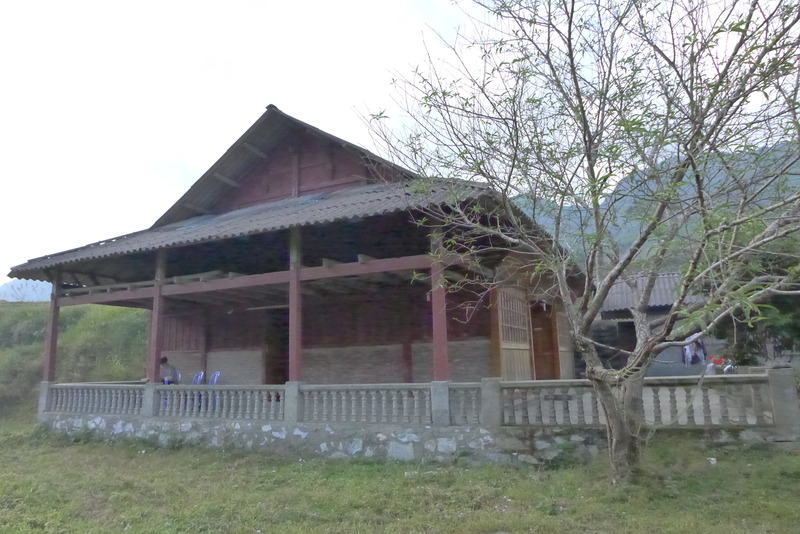 The family we stayed with had built their house with homestay guests in mind. It had a second floor loft with 15 mattresses on the floor, under mosquito nets. It was simple, but comfortable. They had also recently built a modern bathroom with a shower, sink and flushing toilet. I’m quite sure that homestay guests are the majority of their income. In this photo, our guide Diego is insisting that he was just giving the chicken a ‘bath’. I helped cut veggies and stoke the fire. While we waited for the food to cook we went down to the river and watched the local boys catch small fish in vase-shaped baskets. We checked out the river while we waited for dinner to cook. The local boys were catching fish in vase-shaped baskets. Dinner was lovely. The neighbor pulled out an unlabeled jug of some strong clear liquor that smelled like an instant hangover. We got invited to a party at a homestay near-by and hung out with young professionals on a work retreat from Hanoi. They taught us this fun game. That’s Troy in the #15 tank top. He’s got mad skillz.